This entry was posted in News, etc. and tagged books, miller park by jseattle. Bookmark the permalink. The Free Library people send condolences to the keepers of the old library, together with a book, some fridge magnets, bookmarks and stuff. Look for the goodies soon in the library. BTW for those of you into Geocaching, the old library used to have a Geocache tucked away in it. Anyone like to replace it? Hey: pretty much all those lovely books had gone by Monday morning. 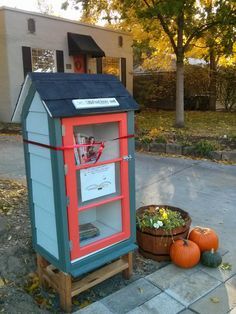 Look through your bookshelves and find some goodies to enrich the lovely new little library. will go by today and put some more in! Are renters allowed to take books or will the generous Miller Park neighbors exclude them from the free library, too? Would this seemingly multi-story Little Free Library make you feel more comfortable? There’s one sort of like it a few blocks north on 20th (and it even has a light in it!). And there’s another one in the same block! Certainly you can take books from any LFL — everyone should feel free to participate.